Why? – Mr & Mrs Smith wants to provide its customers personalised communications and experiences, tailored to the interests and preferences of the individual customer. The hotel booking site wants to create a single of view of its customers, across its multiple channels. Mr & Mrs Smith’s main channels are its website, its app, email and its call-centre. A more customised approach will help Mr & Mrs Smith in targeting its communications and in optimising the opportunities to sell hotel bookings to its customers. What? – I’m not a Mr & Mrs Smith customer myself, but I can think of a few scenarios where personalisation could be pretty useful to both the customer and to Mr & Mrs Smith as a business (see Fig. 1 below). I’d love to find out how Mr & Mr Smith currently go about aggregating all information for its individual customers into unique profiles. How? – Mr & Mrs Smith will use a solution by a company called Sailthru which will help the company to better understand customer interactions at multiple digital touch-points. Tamara Heber-Percy, co-founder and CTO of Mr & Mrs Smith, explains that “we appreciate that personalisation is about people, so we’re confident that our partnership with Sailthru will assist us in truly understanding our customers’ interests and ultimately in creating intelligent, tailored messages especially for each of them”. Main learning point: Personalisation by Mr & Mrs Smith makes total sense. Targeting customers with personalised messages and offers is very logical from both a business and a customer experience perspective. This approach – and the subsequent customer insights that it will return – will no doubt give Mr & Mrs Smith the customer understanding required to tailor its marketing efforts and to predict future customer preferences. A single customer profile and targeted campaigns- As a customer I don’t wanted to be spammed by Mr & Mrs Smith with big blast type mailing lists. I only want to receive communications about offers for hotels that could be of interest to me. I expect Mr & Mrs Smith to be smart about my previous bookings. For example, if I’ve previously booked child-friendly hotels through Mr & Mrs Smith, I don’t expect to be sent lost of info on Honeymoon Hotspots. Personalised recommendations – If I opt-in to receive push notifications from Mr & Mrs Smith on my mobile, I expect these messages to be relevant and tailored to my interests. For example, Mr & Mrs Smith make it more attractive for me to engage with these messages by offering a window during which a discount for a specific hotel is available. I can imagine that Mr & Mrs will be particularly interested in the feedback loop related to its personalised recommendations. For example, if I don’t open the Mr & Mrs Smith email with “Discounts on all our Maldives hotels” what will Mr & Mrs Smith infer from this implicit behaviour? 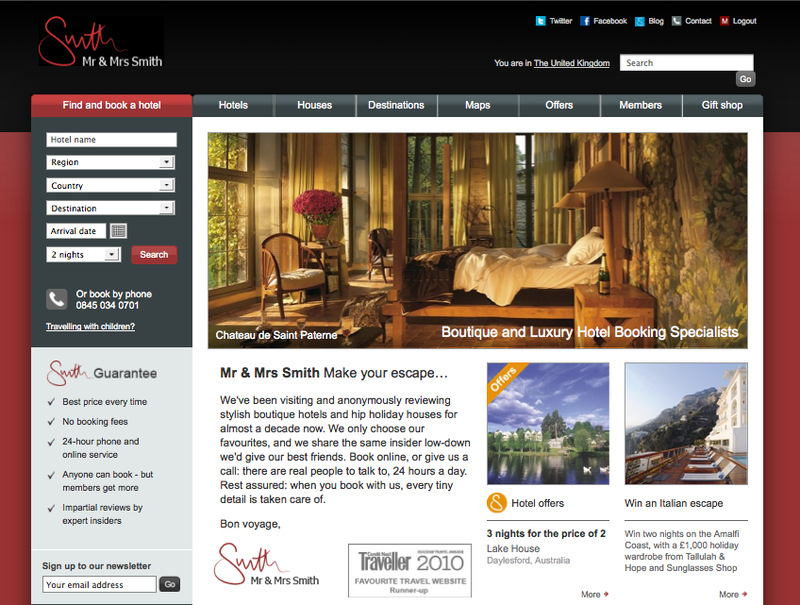 Targeted messaging and editorial – I can imagine that Mr & Mrs Smith differentiate in the way they approach customers who maybe book 1 hotel per year compared to its “Goldmsith” members, who pay £400 per year for specific benefits. The type, frequency and copy of communications will vary per customer segment. Personalised service – When I phone up Mr & Mrs Smith’s call centre with a question, I expect the person at the other end of the line to have all my information at hand. The person helping me with my query knows about my previous bookings through Mr & Mrs Smith, my preferences and the current booking that I’m calling about.